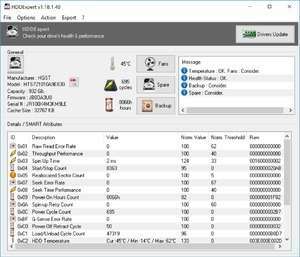 HDDExpert Portable is a free and small portable tool which can be used to diagnose issues and display information about installed hard disk drives. As a portable application, there is no need to install HDDExpert Portable. You may run it from a USB thumb-drive or just from your desktop. HDDExpert will display different information about the hard disk, including the temperature, the manufacturer and model number, serial number, installed firmware and number of write cycles. Version 1.18.2.41 is a freeware program which does not have restrictions and it's free so it doesn't cost anything. For security reasons, you should also check out the HDDExpert Portable download at LO4D.com which includes virus and malware tests. Additional screenshots of this application download may be available, too.